What really is prevention anyway? Prevention in the truest sense of the word means stopping an anticipated problem before it even starts. The importance of primary teeth and preparing for a lifetime of good oral health are the main reasons why parents should bring their children to see a dentist or pediatric dentist (children's specialist), preferably before their first birthday. It's more than just a casual visit: even a one-year old needs a comprehensive examination and even some preventive applications. Parents will benefit from the guidance of “Family Oral Health Education” including: risk assessment for decay; training (hands on) in teeth cleaning; nutritional counseling and use of cups for drinking; fluoride recommendations based on individual needs and important follow-up appointments for monitoring based on the level of risk determined by your dentist. 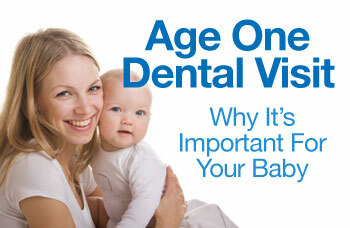 A baby's first visit to the dentist sets the stage for lifelong oral health. For many years, health and childcare professionals have recognized a specific pattern of decay, known as Baby Bottle Tooth Decay (BBTD). The extent and severity of ECC can vary depending on culture, the child's genetic makeup and socio-economic factors. On the other hand, ECC is really much like any other type of tooth decay, dependent on the presence of three conditions: specific bacteria in dental plaque on the teeth, unprotected teeth and the right mix of carbohydrates from food and drinks, such as natural or refined sugars.